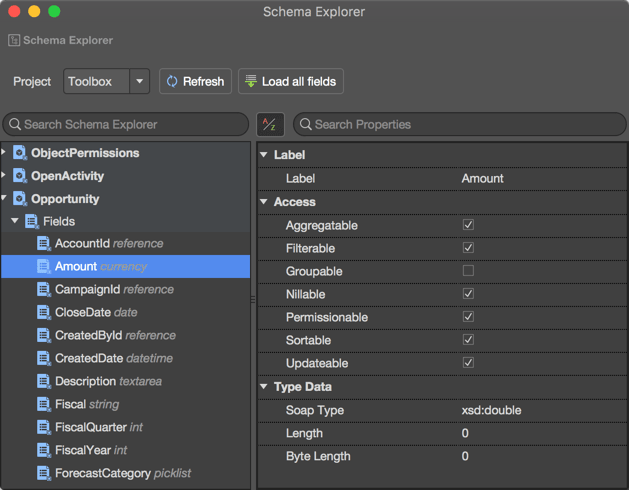 The Schema Explorer is a handy tool for more convenient work with all your objects in a project. You can get a quick overview of the schema of all the standard and custom objects that are available for you in your Salesforce org, trace all relationships between objects, and navigate to a select file in a few clicks. All the fields, relationships, and their properties for any object are also present in one window. 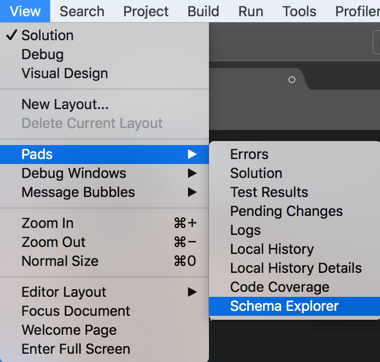 In order to open the Schema Explorer window, navigate to the Main Menu: View ⇒ Pads ⇒ Schema Explorer. The left part of the Schema Explorer contains a list of all your objects that can be created on your org in a selected project. After reselecting a project, you need to click the Refresh button, and the list of objects will be reloaded. When you select any object from the list, its properties appear in the right part of the Schema Explorer. The objects in the Schema Explorer are marked by different colors: standard ones are highlighted with the blue color, while custom ones are shown in a pink'ish color so it is easier to distinguish them. Every object can be expanded and you can see the list of fields and child relationships. The fields are divided to the standard and custom ones by blue and pink'ish colors also. The type of every field is displayed near its name in the list. The child relationship fields show how the records in an object are connected with the records in another one. The list of these relationships is not present for all objects, but only for those which are related. After expanding of the 'Child Relationship', you will see the list of the objects which are linked to the selected object in the Schema Explorer. URLs — help you to generate URLs for the work with this object. 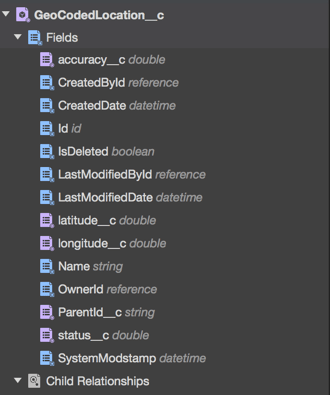 Type Data — the specification of the possible data in a field. Relationship Name — a name of a related item. When you are working with the properties list of an object / field / child relationship, you can select the view of the list. There are two sorting filters, and you can sort the properties in the alphabetical order or in the categorized order. By default, the properties are visible for your in the categorized order. You can easily find a necessary object or its object using the Search field above the list of objects. Just type a search expression, and the list of objects will be filtered to match it. The search text is applied to both objects and fields, and as a result, you will get the list that includes the items with the required text only. To clear the filter, click the x button in the search field. NB: The search in the Schema Explorer works through only loaded fields — those whose objects you've opened during the current TWS session. If you want to search through all the available fields, click the Load all fields button. If you click the Refresh button, you will need to load fields once more to search through them. The navigation from any object in the Schema Explorer to its xml file is available from the context menu of this object by using the Open in the editor option. In addition, you can use the Child relationships list under the object that contains this to navigate to the xml file of a linked object the same way. If a linked object is absent in your TWS project, you will get the appropriate message that the file is absent locally. 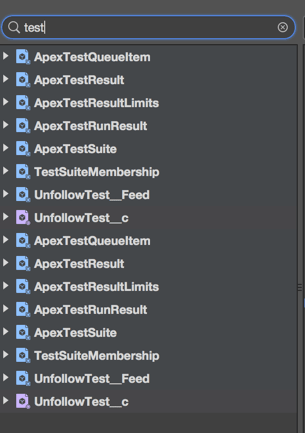 NB: All the data in Schema Explorer is read-only, so you cannot change the properties of an object in the IDE.